The experiences we have as children affect who we are later in life. Makes sense, right? Unfortunately, the difficult events we endure can have a lasting impact. A growing body of science is teaching us about the cumulative impacts of these events, known as Adverse Childhood Experiences (ACEs). Based on research originally conducted from 1995 to 1997, by staff at Kaiser Permanente and the CDC, over 17,000 people received physical exams and completed surveys about their health and childhood experiences. As the number of ACEs increases, risk for health issues like heart and liver disease, depression, risk for sexual violence, and more, also increase. 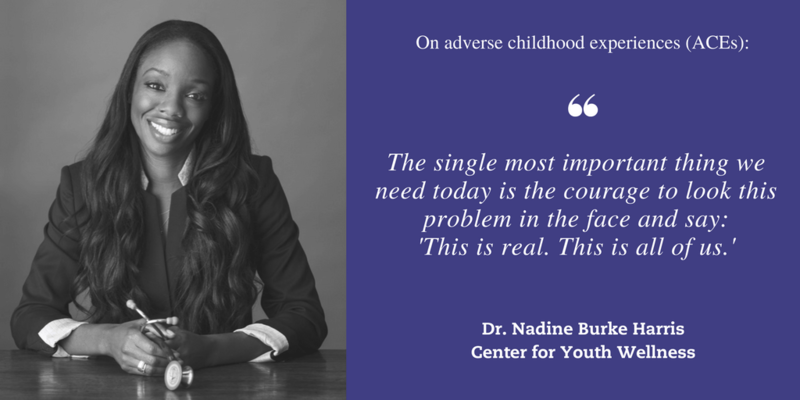 ACEs are incredibly common, and that’s where the work of Dr. Nadine Burke Harris comes in. She tells it best in her own words during her TEDMED talk in 2015. At the Minnesota Children’s Alliance, we celebrate Dr. Burke Harris as she continues her groundbreaking work. Her new book, The Deepest Well is available for purchase now. She will be in town for the Westminster Town Hall Forum on April 10, an event free and open to the public, to discuss her work.